Radhina began her career as a popular singer, currently works as an investigative journalist, and helps run one of Tanzania's most progressive civil society organizations, JEAN Media. As Envaya's Tanzania Program Manager, she provides training and support for the grassroots organizations that use Envaya and tirelessly promotes Envaya across the country. She took some time out of her busy schedule to tell me about her path from pop star to social activist and entrepreneur. How young were you when you started singing? What was life like as one of Tanzania’s popular musicians? I was 16 years old when I started singing in an R&B group with my two sisters (called the Unique Dadaz -- or Unique Sisters). 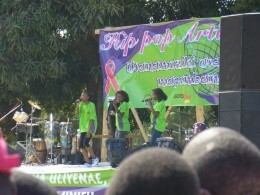 We were one of the first all-female pop groups in Tanzania. We were (and somehow still are) very popular. In 2000 we won the Tanzanian Music Award for best video of the year. We headlined at the Zanzibar International Film Festival and were subsequently featured in “Inside Africa” on CNN. We performed across Africa, and in Europe and Japan. It was fun being a popular singer as a teenager, I made lots of friends and I didn’t have to try hard to fit in. I remember I switched to a different high school because we moved and on my first day at the school it was crazy. All the students were looking out the window to catch a glimpse of me and they followed me around the whole day. There were, of course, challenges (occasional media harassment, etc.) but overall it was an extremely positive experience for me. During my time as a singer I made a lot of great connections, and the recognition I get even today has helped tremendously in my work with Envaya. What moved you to become a social and environmental advocate? Were there specific issues that you wanted to address? Even as a singer in a girl group I did a lot of work with the community around me, by using our fame to bring awareness to different issues that affect our society. We tried to bring about some change through our music, and incorporated positive messages in a lot of our songs. We also did some projects with NGOs on HIV awareness for youth and worked with some anti-malaria campaigns. I was passionate about this kind of work, and was lucky to realize at a relatively young age that it is what I wanted to do with my life long term. I knew I wanted to dedicate my career to bringing about social and environmental change. How did the idea for Envaya begin? Envaya came about through the collective experiences of its founders. Joshua and I became friends in 2007 when he was in Tanzania as a Peace Corps volunteer. My family has started and worked with community based development organizations for a long time, giving me a real understanding of the challenges and needs of such organizations. Joshua and I have been talking for years about these issues, and he was always very interested to hear the Tanzanian perspective on development work. On a visit to Tanzania in January of 2010 he told me that he, his Stanford Computer Science friend Jesse Young, and Jeff Schnurr (with whom he had collaborated on a community based reforestation initiative on Pemba) were starting a technology non-profit with the aim of solving problems for grassroots development organizations, and I was very excited to get involved. 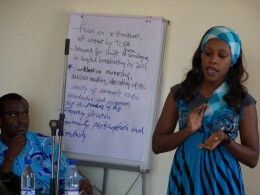 The specific ideas for Envaya came about as a reaction to issues we'd all seen and dealt with in our work in Tanzania. Have you come up against challenges that make it difficult to get your idea out there and make your voice heard? Being a young Tanzanian woman has made it difficult at times for me to be taken seriously. Tanzania is still quite male-dominated, and age is a serious factor in how one is perceived. Sometimes I will walk into an office and the person I'm trying to address will naturally assume that my field assistant, who is a man, is the one in charge. The women in Tanzania who do have senior roles in this sector are often much older than me and they look very different from me -- I look like an average 20 something year old and most women my age in Tanzania are not in this sector. I find myself having to work twice as hard, but I have found that a firm handshake and really knowing what you’re talking about really helps people understand why I'm the program manager of Envaya. I've learned to really appreciate every accomplishment I achieve from the job, big or small. The average person in Tanzania is often aware of the work their local organizations do, but does not realize that there are such organizations across the entire country. With Envaya we are working on providing tools so that individuals in Tanzania can directly engage with and contribute to these organizations. There are individual grassroots movements taking place all over Tanzania, and we're working to help these movements join together. As for the average person outside of Africa... well, we would appreciate any support we can get. We are a non-profit, so even the smallest contribution will go a long way. And at the very least, it's even great for people abroad to just see and appreciate the work that community based organizations are doing in Africa. It would be really great if we could get people to visit the web pages CBOs create with Envaya, and see the efforts and accomplishments of these organizations (most of which have very little outside support). We're also working on ways for people to contribute or collaborate directly to CBOs through Envaya, but that is still a little ways off. What has been the most exciting thing about working with Envaya? Envaya gives opportunities to community based organizations (CBOs) who do great work in their communities to get exposure and connect to and learn from other organizations. I really appreciate the fact that we help eliminate the barriers between CBOs. So many of these organizations have worked tirelessly for years, and have little exposure beyond their communities. They are the ultimate stakeholders in the development sector, yet lacked a significant voice. Now with Envaya, these organizations can showcase all their achievements to the world, connect, and work together. In less than a year, we have over 350 community based organizations online, most of which before Envaya had little or no exposure beyond their communities. The rate at which we are growing and expanding is very exciting, and it's always rewarding to see the stories and great work the CBOs are doing being posted online with Envaya. Are you still making music? Where can we listen to your music? The Unique Dadaz are no longer making music, but you can find some of our videos online with Google. I do occasionally still collaborate with musicians in Tanzania on individual songs though. So of course, I had to search Google for a video. How cool is this?